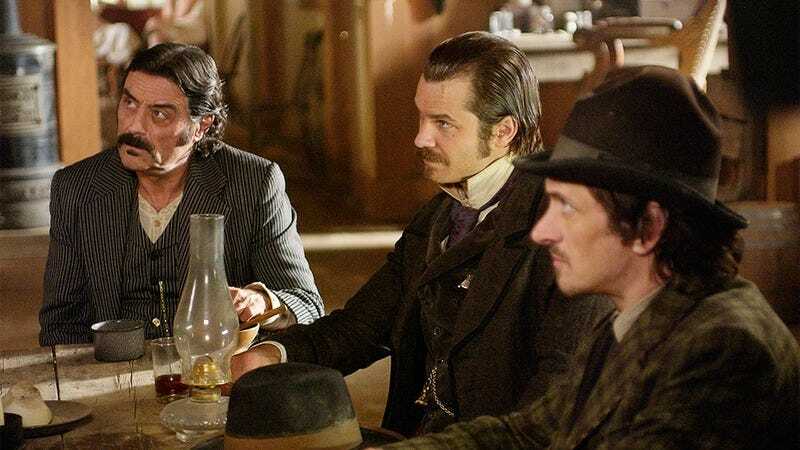 Although it seems to be held together by fans’ wishful thinking and the cast’s tweets, a Deadwood movie is ostensibly in some form of pre-preproduction at HBO. Last year, HBO’s president of programming Michael Lombardo said series creator David Milch had the network’s “commitment” to make a movie that would take us back to that unruly South Dakota town. But if you take Ian McShane’s remarkably profanity-free word for it, the project is a bit further along. In 2016, the erstwhile Al Swearengen said he knew Milch was working on a script for the film, and that everyone in the cast was up for reprising their roles. Now McShane says the finished script has made its way to the premium-cable network. Speaking with TV Line, McShane said a “two-hour movie script has been delivered to HBO.” So, between the teleplay and the cast’s interest, it’s now up to HBO to follow through: “If they don’t deliver [a finished product], blame them,” McShane joked. The actor, who’s heading up the battle between American Gods on Starz later this month, also indicated he’d be meeting with Milch to discuss the script. HBO has yet to respond to McShane’s latest bout of optimism.